The Deutschland Tour 2018 ran through southwestern Germany from August 23-26 and visited five German states in its first new appearance. The terrain between the start in Koblenz and the finale in Stuttgart was very diverse and inspired the course designers to create a race which will left the question of the final overall winner open until the final day. Sprinters and aggressive Classics riders had their chances on the four stages, which covered more than 737 kilometers. Besides a historic and scenic route, the four stages were designed to suit every type of rider. From sprint stages to more demanding days, the varied terrain in the middle of Germany will be featured. The first stage leads from the capital of Lower Saxony, Hannover, to the Harz region in Saxony-Anhalt. Despite short climbs in and around the Harz mountain range, the profiled stage over 185 kilometers, offers a good opportunity for the sprinters. The second stage runs between Marburg in Hesse and Göttingen. With 199 kilometers, it is the longest day of this year's race. After a ride through the undulating middle of Germany, a challenging finish loop rewards a late attack. The third stage leads from Göttingen over 177 kilometers to Eisenach. The finale includes three climbs on the last 40 kilometers and will attract the punchers. Eisenach will also host the start of the final stage. The way to the Thuringian capital Erfurt will see a fight between the classic specialists and sprinters. 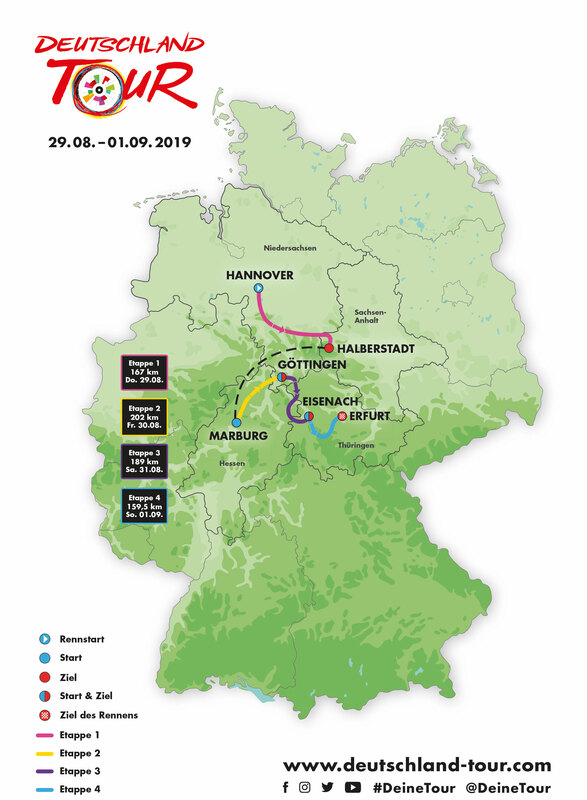 Although only 160 kilometers long but peppered with the ascents of the Thuringian Forest and an uphill finish, the stage and thus the tour remain exciting until the last finish line. "After our successful premiere last year, we absolutely wanted to design again four classic stages. The course this year favors both sprinters and aggressive punchers, which will keep the race open to the last meter. This promises an exciting Deutschland Tour." "The Deutschland Tour is a complete success. Right from the beginning it was broadcasted live for four days on German television and impressive images went from Germany to 190 countries around the world. The atmosphere among fans along the course and in the host cities was phenomenal. When the Tour de France winner is just as thrilled as the young German talents, then it proves the great importance of the Tour of Germany for cycling. We look forward to the second edition of this very modern event that goes far beyond a traditional cycling race." Claude Rach, Managing Director of the Gesellschaft zur Förderung des Radsports, the German subsidiary of the A.S.O. "With Thuringia, Lower Saxony and Saxony-Anhalt, the Deutschland visits three new federal states this year. Regions where we will once again see Germany's biggest stadium at the end of August. Because the Deutschland Tour is our commitment to inspire fans and spectators as well as the 25 million Germans who cycle every week."